You asked, and today it’s here! 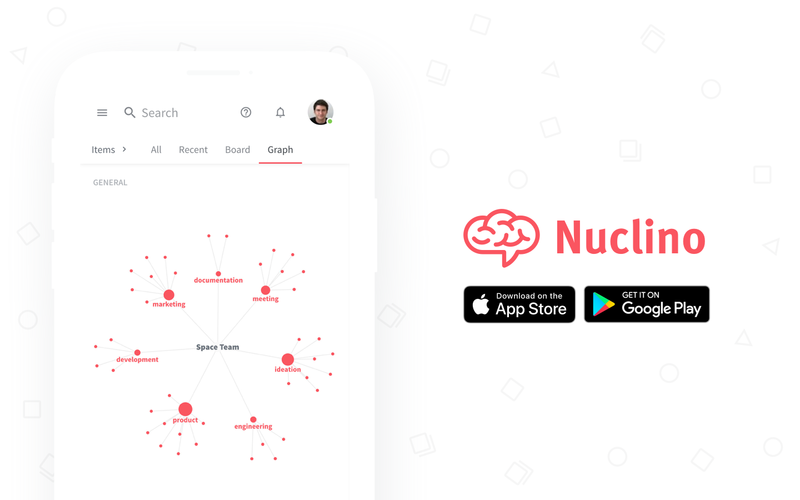 By popular demand, we are taking Nuclino mobile and are proud to unveil our brand new mobile app for iOS and Android. With the new app, you no longer have to be restricted to the confines of a desktop to access your team&apos;s knowledge base and can now collaborate with your colleagues on the move, and with ease. Download it for free from the Apple App Store or Google Play Store. For those who have used Nuclino on a mobile browser, the app will have a familiar feel but with a much smoother experience and a new, polished look. We have worked to make the process of creating, editing, and sharing information on the go as effortless as possible, with intuitive navigation specifically optimized for touch interfaces. The app offers all the best bits of the web-based version and the desktop app, meaning you can collaboratively edit documents in real time, tag and mention your team members, embed images, videos, and other files, instantly search through the whole knowledge base, link documents together and visualize them in a mind map, and more – all while on the go. Aiming to provide complete parity across both platforms, we ensured that both the iOS and the Android edition provide identical experiences. The mobile app is intended to serve as a companion app to the desktop and web-based versions of Nuclino. Download the Nuclino desktop app for Windows, macOS, and Linux here. Give it a try and if you have any feedback, we’d love to hear it! Send us a message at contact@nuclino.com.